At Vanguard Veterinary Hospital, we have a special interest in working canine medicine. Our doctors have an extensive history and experience with working dogs of various breeds, jobs, and sports. 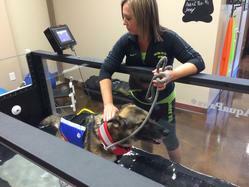 Our hospital was designed with the working canine's physical and medical needs in mind. We have an exam room designated for their evaluation, a state of the art rehabilitation facility and advanced diagnostic and treatment capabilities. We understand that the physical stressors placed on a working canine are unique to their job, and through early identification of lameness, gait abnormalities and pain, we aim to improve their working longevity and quality of life.